thin boundary structures of molecular size on the surface of cells and subcellular particles, as well as canaliculi and vesicles piercing the protoplasm. Biological membranes are no more than 100 angstroms (Å) thick. Their most important function is to regulate the transport of ions, sugars, amino acids, and other metabolic products. The term “biological membranes” was initially used to describe all kinds of boundary structures found in living organisms: cover tissues, gastric and intestinal mucosae, walls of blood vessels and renal canaliculi, myelin sheaths of nerve fibers, membranes of red blood cells, and so on. It was demostrated by the middle of the 20th century that in most boundary structures the effective barrier function is performed not by all the elements of these complex formations but only by the cell membranes. It was possible to show by electron-microscope studies and X-ray diffraction analysis that the structure of the surface membranes of red blood cells, nerve and muscle cells, bacteria, plasmalemma of plant cells, and others is similar to that of the membranes of subcellular structures, such as the endoplasmic reticulum, mitochondria, cell nuclei, lysosomes, and chloroplasts. Biological membranes occupy a vast area (for example, in the human body surface membranes alone cover an area of tens of thousands of square meters) and play a universal regulatory role in metabolism. Hence, a study of the structure and functions of biological membranes is one of the most important objectives of cytology and molecular biology. The functions of biological membranes are diverse (see Table 1). By covering the cell and separating it from the external medium, biological membranes ensure the morphological integrity of cells and subcellular particles—their strength and elasticity. By maintaining the uneven distribution of potassium, sodium, chlorine, and other ions between the protoplasm and external medium, they promote the development of differences of bioelectric potentials. Properties of biological membranes are largely responsible for the generation and conduction of excitation in nerve and muscle cells as well as in the places of contact between them, that is, in the synaptic endings. Biological membranes of mitochondria are the site of a strictly ordered arrangement of the enzymes that participate in the synthesis of energy-rich compounds. The functional properties of biological membranes are closely related to their structural organization and largely determined by it. While studying the permeability of cell membranes in 1902, the German scientist E. Overton observed that substances readily soluble in lipids cross the membranes easiest of all and assumed that lipids are present in surface cell membranes. In 1926 the American biologists E. Gorter and F. Grendel isolated lipids from hemolyzed human red blood cells and arranged them in a monomolecular layer on the surface of water. The total area of this layer was approximately double the surface of the red blood cells. They concluded from this that the lipids of biological membranes are arranged in a bimolecular layer. The surface tension of a cell membrane (0.1 millinewton per m, or dyne per cm) is less than that of a layer of pure lipid (10 milhnewtons per m, or dynes per cm) and close to the surface tension of proteins. They assumed, therefore, that the bimolecular lipid layer of biological membranes is covered on two sides by layers of protein (“sandwich” structure). Study of the cell surface with a polarizing microscope revealed that lipid molecules are arranged perpendicular to the cell surface and protein molecules are parallel to it. Use of the method of electrical conduction made it possible to measure the capacitance of the cell membrane, which was 1 microfarad per sq cm, and calculate the thickness of the lipid layer, which turned out to be 55 Á. Based on these findings, the English biologists J. F. Danielli and H. Davson proposed in 1935 a model of a biological membrane largely consistent with modern ideas about the structure of biological membranes. It was shown by X-ray diffraction analysis, electron microscopy, and optical and biochemical methods that the surface cell membrane and membranes of the subcellular particles—mitochondria, nuclei, microsomes, lysosomes, and others—are similar in structure. They consist of a bimolecular lipid layer (mostly phospholipids) 35 Å thick and two nonlipid layers each 20 A thick (the American investigator J. Robertson). The external surface of many biological membranes is covered with mucopolysaccharides, and their inner surface is lined with structural or enzymatic protein. Electrostatic attraction is assumed to exist between the phospholipid and protein molecules. Mitochondrial membranes differ somewhat in structure from surface cell membranes (Figure 1). The phospholipids and proteins in the inner membrane of the mitochondria appear to be bound together by stable hydrophobic interaction and they form complexes (repeating units) from which the entire membrane is constructed. Figure 1. Diagram showing the distribution of membrane elements in a cell. 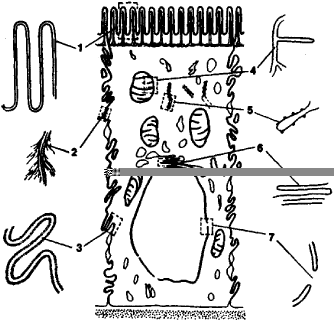 It is based on an electron micrograph of a section of an intestinal epithelial cell: (1) surface membrane (at the border) through which absorption takes place, (2) desmosome membrane—site of contact with other cells, (3) paired surface membrane, (4) mitochondrial membrane, (5) endoplasmic reticulum membrane, (6) Golgi apparatus membrane, (7) nuclear membranes. Substantial progress was made in understanding the structure and functions of biological membranes by studying models of them—artificial phospholipid membranes consisting of a bimolecular layer of phospholipids. The physical properties of such a film are similar to those of natural biological membranes; it is up to 61 Å thick and has a capacitance of 1 microfarad per sq cm. Adding a small quantity of protein to the solution bathing the artificial membrane decreases its resistance sharply (approximately 1,000 times), bringing it close to the electrical resistance of natural biological membranes. Under certain conditions, electrical oscillations may arise in such a “reconstructed” membrane that resemble in amplitude, duration, and conditions of origin the electrical oscillations found in excited nerve fibers. Adding an antibiotic like valinomycin or gramicidin to the solution bathing the membrane induces selective permeability to potassium and sodium ions. Biological membranes are under intensive study, and it is expected that their structure and functions will be completely elucidated in the near future. Rukovodstvo po tsitologii, vol. 1. Moscow-Leningrad, 1965. Chapter 2. Finean, J. B. “The Molecular Organization of Cell Membranes.” Progress in Biophysics and Molecular Biology, 1966, vol. 16, pp. 143–70. Italian specialists in biological membranes review recent developments in membranes and investigate how they can be used to improve the quality and efficiency of artificial organs as an aging population increases the demand for organ transplant while it decreases the supply. and in the form of biological membranes and synthetic 2D-polymers. It is a constituent of certain phospholipids that are components of biological membranes and lipoproteins. The system involves the use of needles for the intermediate active transport of drugs and fluids across biological membranes. The biological implants as pericardium and other biological membranes are easy to obtain, have good elasticity and resilience (ALVARENGA, 1977) besides to be biocompatible with the intra-abdominal environment. Revin VV, Revina ES, Devyatkin AA, Gromova NV (2012) The Role of Lipids in Functioning of Excitable Biological Membranes. 1] Sticking of any drug dosage form to the biological membranes, in the gastrointestinal tract or any other body cavity, can be described as bioadhesion and/or mucoadhesion. The role of disorders of the barrier and the matrix functions of the lipid bilayer of biological membranes in pathology. The basis for the electrochemical detection of protein binding are laboratory-produced biological membranes that consist of so-called supported lipid monolayers -- two-dimensional molecular structures that are essential building blocks of cellular membranes. Recently his group has applied single molecule techniques to study protein channel gating, develop new methods for studying biological membranes, and develop new approaches for biosensing. DAG's physical characteristic of intrinsic negative curvature was postulated to be important in the bending of biological membranes that occurs during fusion stalk formation and in maintaining the shape of small vesicles or tubules. Due to the exceptional stratum corneum lipid composition, with long chain ceramides, free fatty acids and cholesterol as main lipid classes, the lipid organization is different from that of other biological membranes.